With the IWA 2012 & Outdoor Classics, we have been exchanging emails for the past two weeks with NLAirsoft.com of having an airsoft meetup just like what the airsoft media did during the Shot Show 2012. It was a nice idea by Airsoft Medicine and No Airsoft for Old Men that we imported this to Europe. Slickaxe brought it up, so we just sort of jumped into it, so the credit is more to NLAirsoft.com. Just imagine all the blokes from the Airsoft Media based in Europe who will be able to make it to the event meeting with airsoft manufacturers, tactical gear makers, and airsoft retailers in one room. It’s going to be fun since it’s nice touching base with the airsoft industry since only a few of the European airsoft media were able to go to the US for the Shot Show. If you are an exhibitor at the IWA 2012 & Outdoor Classics with the airsoft market as one of your segments, you are invited to join us, mingle and given the opportunity to present your products or plans either via slide presentation or a "show and tell" to the airsoft media and other interested individuals and purchasers. If you intend to give a presentation, please contact us immediately so that we can schedule it. We are not yet sure about the length of your presentation, but please assume that this will be more an informal atmosphere. If you sell airsoft or tactical products in your home market, then you can watch the wholesalers, distributors, and manufacturers in one place. This will help in making purchasing decisions, and also a best way to link up with brands and products that you may want to stock and sell. This meet-up is also for the airsoft media such as magazines, blogs, and news sites to touch base and compare notes with one another. Most have been cooperative with one another, and this meetup will help them discuss in an informal way on how to improve airsoft reporting for the airsoft community and the general public. You’re also welcome to attend and watch since after all, you’re the main target market for the abovementioned groups. So if you want to look at the latest presentations and plans, then you might want to include the airsoft meetup in your schedule whilst attending IWA 2012 & Outdoor Classics. The meetup is limited to 40 spaces, with a priority given to those who want to make a presentation and the airsoft media. But we’ll keep you posted if this number can be increased as we’re still in the finalisation stages for the meetup and the room can accommodate a far larger number of attendees. Please contact us immediately if you want to attend the meetup. SO WHERE CAN YOU FIND THE MEETUP? Please stay tuned for updates such as changes to schedule and attendance. So if you want to attend, please contact us by using our CONTACT US page or email NLAirsoft at info@nlairsoft.com and state if you want to make a presentation or be a participant. Since slots are limited for the meantime, the earlier that you can confirm your attendance, the better for you to have your slot. See you at the Airsoft meetup and don’t forget to check the Popular Airsoft and NLAirsoft.com websites for updates on this. The real steel Troy Battle Magazine is designed and manufactured by Troy Industries to aid common issues found with the standard AR platform magazine. This magazine is made of mostly polymer making it practically weightless. The exterior is designed with patterned “dragon-style” scaling that makes pulling the magazines from pouches a lot smoother. This pattern also ensures the magazines stays secured inside the mag pouches. The Battle Mag is also designed with a special spine that prevents over-insertion. – The Airsoft version of Troy Battle Mag is a project with Socom gear and G&P. – It’s also an excellent replica of the Troy Battle Mag. – It comes with all the cosmetic features mentioned above, along with its functions. – The Airsoft version of Troy Battle Mag is a 340 round Hi-Cap magazine that fits most M4/AR AEG platforms. – Its heavy duty winding wheel ensures consistent feed and pressure. – This project is done by G&P and MadBull/ SOCOMGEAR. Soon to become our personal favourites, we have two excellent new products for you – a compact tactical red laser, and a sturdy foldable bipod. The red laser is very compact and mounts to any 20mm rail type to provide an excellent weapon-mounted laser. Similarly the bipod mounts to a 20mm rail, but can also be barrel mounted – a very rigid rest which has extendable legs and can be folded back when not in use. Click through to the items below to check them out. We have now stocked Wiley X tactical eye wear and gloves in our online store. Wiley X is renowned in both the airsoft community and military and law enforcement community for their high quality, ballistic rated eye protection. No matter how stressful the situation, Wiley X’s line of mission critical eye protection will always provide you with crystal clear vision and keep your eyes protected. We are proud to offer a large selection of Wiley X premium tactical ballistic goggles. Airsoft Megastore’s industry leading 125% Price Match Guarantee ensures that you will always get the BEST deal on our full selection of Wiley X products. Airsoft Megastore is an authorized dealer of Wiley X, which means that we are committed to providing our customers with the very best selection of Wiley X’s top-of-the-line ballistic rated eye protection at the absolute lowest price on the market! Hey guys, Two of the latest videos up from Dagger Throw, as always quality HD with commentary! Starting February 6th, we will kick off our Tax Refund Sale! For the next 8 weeks we will have a sale the first 3 days of each week (Monday, Tuesday & Wednesday). Week 4 (February 27-29) will feature 17% off all Tactical Lighting! Just enter the code "TAX12" at checkout and 17% will be taken off all Tactical lighting in your cart! All notifications for these sales will be sent thru our Newsletter or on Facebook, so be ready! HAZARD 4: NEW PRODUCTS AVAILABLE NOW! From Bags to hats to patches, Hazard 4 covers it all. You need the highest performing equipment in the field to help give you the advantage, and these products don’t fall short! All offers Cannot be combined with other offers or applied to previous purchases. Thumpy: You have to see the airsoft death race! This one is from a group called DITCHPIGS, who have their own mobile command post vehicle…but this is something a little more…um, SPECTACULAR! See all their videos on line, or SCOOPED by Thumpy at my SCOOP.IT channels…. Intelligent Armour have developed two great belts, made here in the UK. Manufactured in four colours, Tan, Black, Olive Drab and Foliage Green. This price is worth just under £400! The winner of this competition will receive a set of eights belts in his or her size or in a mixture of sizes to share with friends! Question: What brand/make of buckles do we use on our Intelligent Armour Belts? Competition rules: One entry per email address, multiple entries from the same email address will not be counted. The winner will be picked at random on the 31st March 2012. The name of the winner will be posted on this page (http://www.body-armour-protection.co.uk/ia-competitions.html), the winner will be contacted prior to the posting of any name. 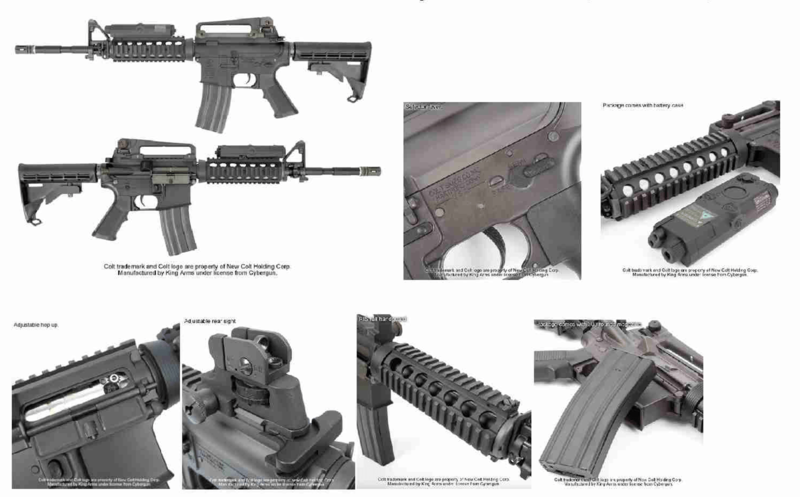 Description: The Colt M4 RIS full metal rifle is an official licensed product (licensed by Cybergun), with full trademarks and logo engraved on the metal receiver. The integrated bolt catch / release system makes the hop up adjust easily accessible. Package comes with a battery case and 300 rounds magazine. Material : A-Tacs-FG CAMO, Cordura 500D Nylon fabrics made in the USA.